Friends, do you know what I want for us in 2015? Freedom. I want us to live set free lives and I want us to feel empowered to lead our children in living set free lives! So today I’m launching a new site with lots of new fun things, in hopes that this will be a little space where we can remind each other (yes, I love hearing from you!) of the freedom found in being wholeheartedly loved by God. Fun thing two~ Are you up for studying Parenting the Wholehearted Child with your girlfriends, or journeying through the book in a couple’s Bible study? Well, I have a new free study guide available now for download! We’re better together so grab some friends and dig in! Fun thing three~ Are you in need of a little quiet space where you can be reminded that the shape of your child’s heart is not wholly dependent on your performance as a parent? Well, I’m sharing with you my new happy place – my pinnable grace page - a place where I will add new quotes and verses weekly to settle our anxious hearts. Fun thing four~ Would you love to hear from some amazing writers who inspire me? Good! Me too. So I have some amazing guest writers lined up who will be sharing their hearts and wisdom with us here! How would your life, and your parenting, look any different if you really believed and lived from the truth that God can’t stop loving you? I'd really love for you to pause, reflect, and pray about your answer to this question. Maybe even write your answer down in a journal or in the comments section below if you’re feeling brave. This means that nothing you thought, said or did yesterday, today, or even tomorrow can make you less lovable to God. I mean, really, think about that! And yet, it can be so hard to accept. I think that's why I've changed this verse in my mind so many times in the past to read "absolutely nothing BUT _______ can get between God's love and me." And because of my unwillingness to accept God' grace for me in my failure, I lived with a lot of guilt and shame over the mistakes I made. But what if this was the year when you lived from the truth that God really, truly can’t stop accepting you - that God can’t stop being pleased with you- that God can’t stop forgiving you, all because of what Jesus has already done for you? What kind of freedom would you be walking in? How would that impact and change your life? What shame would you shed? What grace would you be empowered to give? Oh friends, there is so much grace waiting for us. And what I'm learning is that the more honest I get about the things I’m afraid can separate me from God’s love, the more my heart is utterly melted by the way He loves me and the more I desire to chase hard after Him and throw every piece of my little life into His hands. Even, and especially, the pieces that might feel so unlovable. Because He already knows it all. And He wants us to be free. Doesn’t that just sound so good? So this year, I’m going to continue to blog whenever life allows (and I never know when that will happen, and I don’t want to fill your inbox with anything other than the good stuff.) 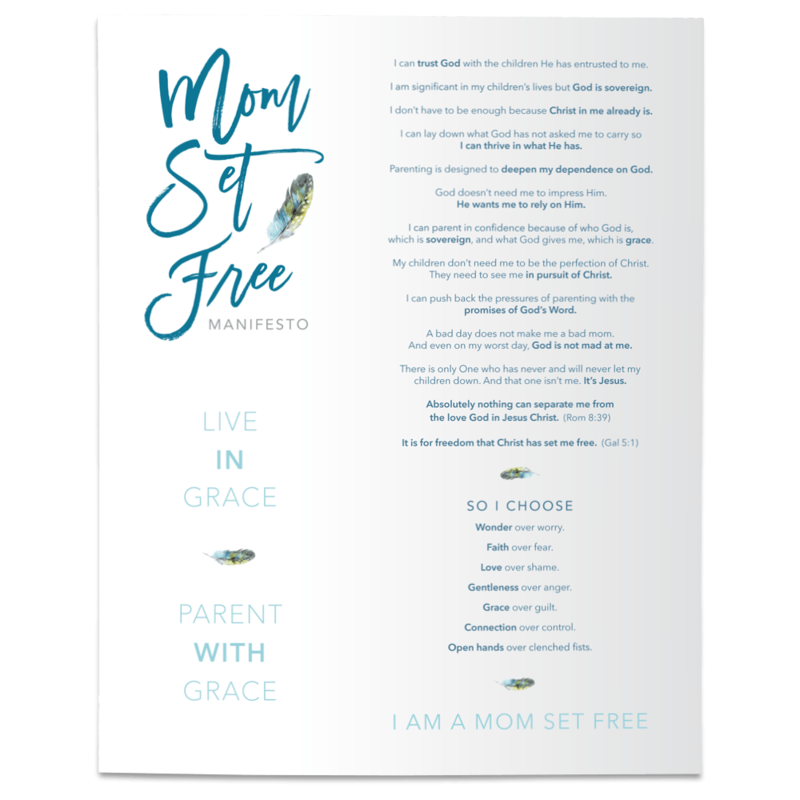 I’m going to continue to share with you the things God is teaching me about parenting with grace, the mistakes I make, the ways God is using motherhood to keep me close to Him, and the grace that keeps setting me free. So subscribe here so you'll be sure not to miss anything your heart will surely want to hear. I really hope you’ll join me! Let’s travel this 2015 together, inspiring and encouraging each other to live in freedom. Love you, my friends, and I’m more thankful for you than you know! What Russell Wilson teaches us about "giving God the glory"